It certainly wasn't the test Zidane was looking for, as Real Madrid got defeated 3-1 to a more in-form PSG side, in a pre-season friendly held in the United States, at the Ohio Stadium. Marcelo scored the only goal for the Merengues from the penalty spot. 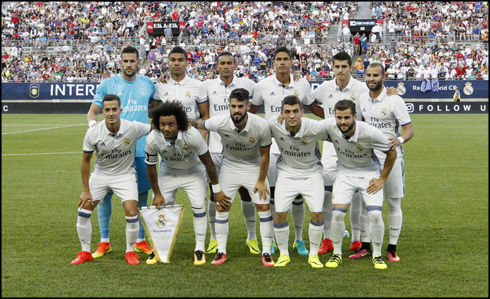 Real Madrid and PSG met each other at Ohio this Wednesday night, in a game that marked the Merengues' pre-season debut in 2016-17. With his roster still very incomplete, Zidane approached this game with the strongest eleven he could come up with, but it ended up not being good enough to hold the French champions at bay. PSG beat Real Madrid 3-1 and the story of this match was basically written in the first half. The French got a 3-goal lead still before the 40th minute and despite Marcelo's goal just a few moments before the break, the current European champions simply couldn't find a way to get back in the game in the second half. With the likes of Benzema, Cristiano Ronaldo, Modric, Sergio Ramos, James Rodríguez, Gareth Bale, Kroos, Pepe and Keylor Navas still unavailable to give their contribution to the team, Zidane didn't have a lot of options left when the time came to name his team ahead of this match against PSG. In his first game of the pre-season, Zinedine Zidane picked out several familiar faces to his starting eleven. Casilla was the goalkeeper, while Marcelo, Nacho, Varane and Danilo formed the back four. In midfield, Casemiro, Kovacic and Isco stepped up to attempt to organize the Merengues' game and more upfront the tasks were handed to Lucas Vázquez, Jesé Rodríguez and Álvaro Morata. Basically, just one new face in this lineup, as Morata marked his return after a 2-year adventure in Juventus. The French side proved to be on a more advanced stage of their preparation for the new season and Real Madrid just couldn't handle the higher dynamic imposed by PSG. The opener came on with just 2 minutes played in the first half, when Ikone found no opposition in a 25-yard run and easily beat Casilla to put Paris-Saint Germain on the lead. In the 35th minute, a weak pass from Kovacic ended up falling on Thomas Meunier's feet and the 24-year old defender struck it with power and precision to increase the lead to a 2-goal difference. 5 minutes later, PSG burried another and again from a Meunier strike, to really put Real Madrid on a bad spot. Marcelo still reduced the lead to 3-1, but it didn't actually spark any reaction for the second half, probably because Zidane preferred to change his whole team and give some playing time to the youngsters. The Norwegian talent Martin Odegaard and Zidane's own son, Enzo Zidane, were just a couple of the players sent in for the second half. Madrid may have not gone for the comeback, but at least they also didn't allow PSG to inflict more damage at the back. Next on the list is Chelsea, this Saturday at the Michigan Stadium. Attackers: Lucas Vázquez, Jesé Rodríguez, Alvaro Morata. Cristiano Ronaldo next game with Real Madrid is a pre-season friendly on July 30 of 2016, against Chelsea. You can watch Juventus live stream, Real Madrid vs PSG, Celtic vs Barcelona, Borussia Dortmund vs Manchester City, MLS All Stars vs Arsenal, and Bayern Munich vs AC Milan, all matches provided from our football live game pages.